Since Saturday, parts of the mid-Atlantic have be hit with more than 10 inches of rain, causing numerous rescues and evacuations. Flash flood watches and warnings were issued for about 30 million people along the East Coast as heavy rain continued to pelt the region on Wednesday. 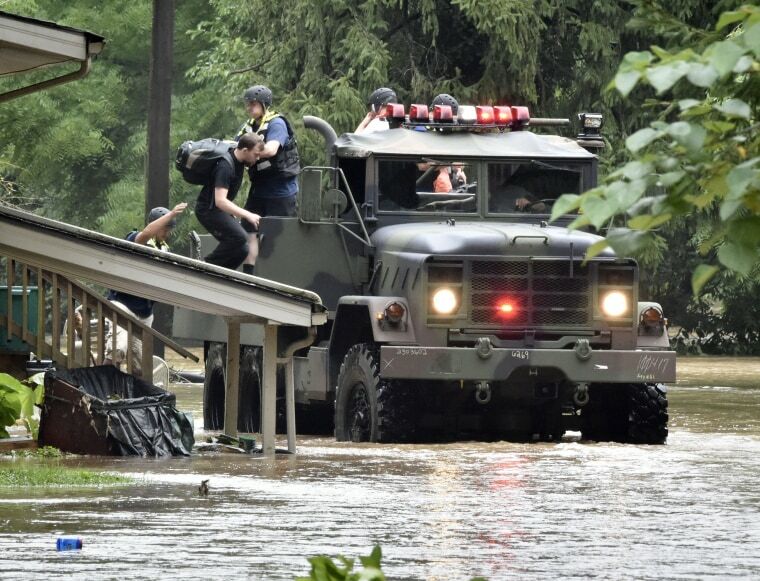 Since Saturday, parts of the mid-Atlantic have been hit with more than 10 inches of rain, causing numerous rescues and evacuations, according to the National Weather Service's Weather Prediction Center. From eastern North Carolina to central New York, heavy rain was expected to continue on Wednesday, with parts of Pennsylvania and Maryland at risk for as much as 8 inches. "We have a stream of heavy rain coming in off the Atlantic ocean that has been coming in for days," said Steven Strouss, a meteorologist for NBC News, who added that other areas could receive 1 to 3 inches of rain on Wednesday. Pennsylvania's Hersheypark was forced to close for the second time this week because of the relentless rain. In other parts of Hershey, rescuers went door to door helping residents out of their homes by inflatable boats. "The heavy rain has been focused over central Pennsylvania for last couple days," Strouss said. "The ground was already saturated, and the rivers and streams and creeks can't handle all that water, so that's why we saw all that flooding." By Wednesday afternoon, power failures in Pennsylvania had fallen below 5,000, utilities reported. The state Department of Health said no storm-related deaths had been reported. Earlier in the week, a 19-year-old woman went missing in Pennsylvania after she and a 22-year-old woman were swept away in a creek. The 22-year-old woman was able to escape, but the 19-year-old, Laura Olweiler, wasn't. Pennsylvania State Police said Wednesday afternoon that conditions remained too hazardous for now to continue the search for Olweiler. In Fairfax, Virginia, on Wednesday, some roads were under water, nearly swallowing cars in some areas. In Baltimore County, Maryland, several homes were crippled after large trees toppled onto roofs. Even as far south as Florida, turbulent weather created riptides, which made swimming extremely dangerous for beachgoers. Strouss said the heaviest rain would shift east on Thursday, giving central Pennsylvania some much-needed relief. "It looks like the focus moves more to the east tomorrow and is more over New England and the immediate East Coast and won't be so focused over Appalachia and the mid-Atlantic," he said. Earlier this week, at least two people died amid the strong downpours in the mid-Atlantic and Northeast. A tree fell on a home in Agawam, Massachusetts, on Monday, killing another person, but it was unclear whether weather played a role. While the East Cost was hammered by rain, the West Coast suffered under an ongoing heat wave. An excessive heat warning was issued on Wednesday for parts of Arizona, according to the National Weather Service, where temperatures were expected to be about 116 degrees. High temperatures Tuesday broke daily records in parts of Southern California, where Death Valley hit 127 and Palm Springs reached 121, according to the weather service. The National Park Service closed almost 8,000 acres of Yosemite National Park in California — including hotels and campgrounds in the Yosemite Valley and Wawona — as high temperatures and low humidity complicated firefighters' efforts to defeat the Ferguson Fire. The fire has charred more than 38,000 acres since it started July 13. The affected areas are expected to remain closed through Sunday, the park service said. It was so hot in Mesa, Arizona, on Tuesday — 105 degrees — that a 37-year-old man stole an ambulance from Banner Desert Hospital because, police said, "he thought it was too hot to walk home." He was charged with two felonies.